Back from a lazy long weekend here is the recipe for our Thanksgiving turkey – with plenty of time until next year, or a head start for Christmas if turkey happens to be on your menu. I am not bound by tradition when it comes to stuffing, so I don’t consider it essential to include bread. This recipe was initially inspired by a goose stuffed with lady apples but has evolved quite a bit. Pick leaves from herbs and discard stalks. Set aside. Place half the slices of bacon in a large skillet over medium heat. Once it is brown and crispy on one side, turn over until brown and crispy on the other. Remove from skillet and set aside, keeping rendered fat in the pan. Peel, core, and cut apples into quarters, then cut each quarter in half crosswise. Brown apples in bacon fat for 3-5 minutes over high heat. Crumble 2/3 of the chestnuts, leaving about a third whole, and add them all to the apples. Stir to combine and remove from heat. Chop the thyme and sage and add to the apple/chestnut mixture. Transfer to a bowl. Place the remaining slices of bacon in skillet over medium heat and repeat browning process. Remove from skillet and set aside, keeping rendered fat in the pan. Slice onions and cook them in bacon fat until translucid and just starting to brown. Add to apple/chestnut/herb mixture. Chop bacon, chop parsley leaves, add to the rest of the stuffing, season generously with salt and pepper, and mix carefully. Note from 25 November 2011: I edited the recipe slightly and reduced cooking times after another Thanksgiving turkey cooking adventure this year. Take turkey out of refrigerator well in advance (for example before you start making the stuffing), so it has time to come to room temperature. Once turkey is at room temperature, separate skin from breast meat and rub softened butter onto breasts. Season inside of turkey, then spoon stuffing into the two cavities, front and back, and sew shut with kitchen string. Rub skin on all sides with generous amount of coarse sea salt and black pepper, and tie legs together with string. Place turkey in a roasting tray, breast side down, and roast for 10 minutes. Turn turkey breast side up and roast for another 10 minutes. Reduce the heat to 350°F (175°C), add a little water at the bottom of the pan, and roast for about 3 to 3 1/2 hours, or until a thermometer* inserted in the inner thigh registers 150°F (65°C). While the turkey cooks, place a wet muslin cloth over the breasts and baste over the cloth and legs regularly, adding water to the juices if needed. Remove the cloth after about 3 hours to allow the skin to become very crispy. Let the turkey stand for 45 minutes. Meanwhile reduce the juices and make the gravy, but I won’t tell you how because I prefer to just reduce the juices, keep them piping hot, and pour them over the meat before serving. (Full disclosure: I have asked willing guests to make gravy in the past couple of years, and I must admit it was very good – maybe next year I will tackle the sauce myself). Check at the joints of the thighs and legs. If they are still uncooked (juices running bloody), remove from the turkey, return to the oven, and cook for another 25-30 minutes or until the juices run clear. Carve and serve breasts, thighs, and legs. *I acquired a thermometer unintentionally when the owner of Flying Pigs Farm gave me one at the market one day. He was obviously nervous I might overcook the beautiful loin roast I had just bought from him. I must admit the thermometer came in handy for the pork, and is very useful for turkey. This entry was posted on 29 November 2010 at 09:43 and is filed under Christmas, Fall, Holidays, Meat / Poultry, Thanksgiving, Winter. You can follow any responses to this entry through the RSS 2.0 feed. You can skip to the end and leave a response. Pinging is currently not allowed. I’m going to do your turkey for Christmas but am going to try the brining first – Bouchon also has a recipe for brining port of chicken and it is really good so I can imagine it would add to the taste and moisture of the bird. Look forward to getting the post thanksgiving 2012 update! My wife and I raise small flocks of Narragansett turkeys. Our favorite recipe is to brine the bird with a 50/50 blend of fresh apple cider and ice water, to which a cup of kosher salt and a cup of sugar is added for each gallon of liquid. Marinate at least overnight… up to 24 hours at a temperature not to exceed 42 degrees. Rinse and dy the bird thoroughly. salt and pepper the inside. Make a paste of soft butter, powdered sage and crushed garlic. Using a small spatula, loosen the skin from the breast and push a liberal amount of the paste under the skin. Rub the entire outside of the bird with melted butter, then salt and pepper. Using a v-shaped roasting pan, place the turkey on its side. Pour 2 to 4 cups of fresh apple cider into the pan and cover tightly. Roast at 325 for one hour. Switch the turkey so it rest on the other side, baste, cover and roast at 325 for another hour. Place the turkey, breast-up, baste, cover tightly and bake at 325 for 30 minutes. Check the temperature at the thickest part of the thigh. When the temperature reaches 150, remove the cover and continue to roast until the thigh temperature reaches 160. Turn oven heat off and monitor the temperature. You want it to reach 165. Note: The breast of a heritage turkey is smaller than the franken-bird, so you want to make sure that the breast does not overcook while you wait for the leg and thigh meat to reach the proper temperature… That’s the reason for placing the bird on its side. Note: Most of the fat in a young heritage turkey is deposited in the neck cavity. For that reason, you will not want to place stuffing in that area. Thank you for the recipe and interesting informartion – will keep this in mind for next year! The recommended rule of thumb for turkey is 1lb per person. We were 14 adults for Thanksgiving and our bird was 16-18lbs. There was some left over but not too much, I think that would be a good bet. 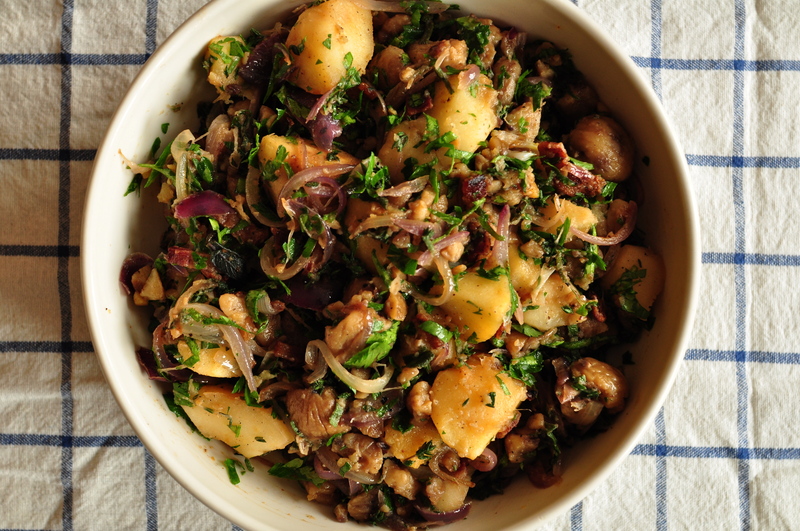 With this stuffing I always make mashed celeriac with parsley and sauteed mushrooms and cranberry sauce – it all goes so well together I can’t bring myself to do anything else. Very much looking forward to wine pairing suggestions!